The prolific Marc-Aurele Fortin was a painter, watercolourist, printmaker and draughtsman whose highly decorative, colourful landscapes celebrate the picturesque in nature. Among his favourite subjects were huge, leafy elm trees, rustic houses, hay carts and Montreal's port; his rare human subjects typically appeared dwarfed by nature. Fortin was technically inventive, experimenting with methods of watercolour, oil painting and mixed media. Fortin studied in Montreal under Ludger Larose and Edmond Dyonnet, and under Edward J. Timmons at the Art Institute of Chicago. There, he discovered the works of Jean-Francois Millet, Claude Monet and Mary Cassat, as well as those of the British painters Frank Brangwyn and Sir Alfred East. 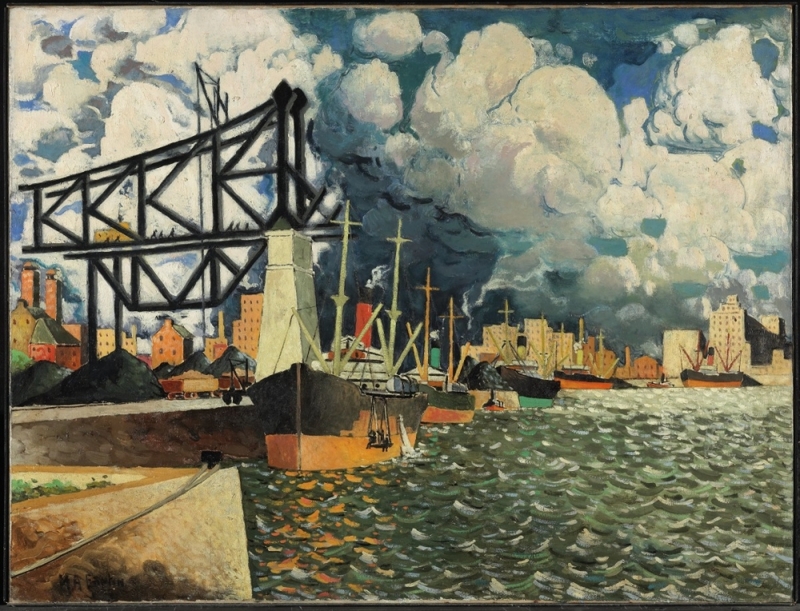 Returning to Montreal in 1914, Fortin worked at odd jobs and painted in his spare time. It was after a short trip to England and France in 1920 that he began to work seriously as a painter and to show his work, which included scenes of the island of Montreal, largely rural at the time, and of his birthplace Sainte-Rose, north of the island. In the summers, he traveled to Quebec City, the Ile d'Orleans and Charlevoix, drawing and painting houses and rural scenes. 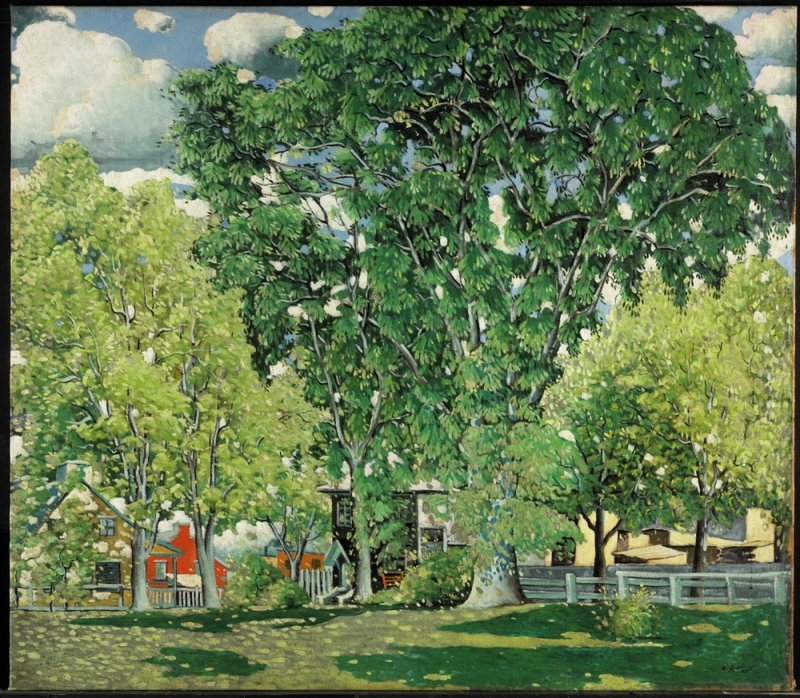 Between 1923 and 1926, he painted many of his celebrated tree scenes. 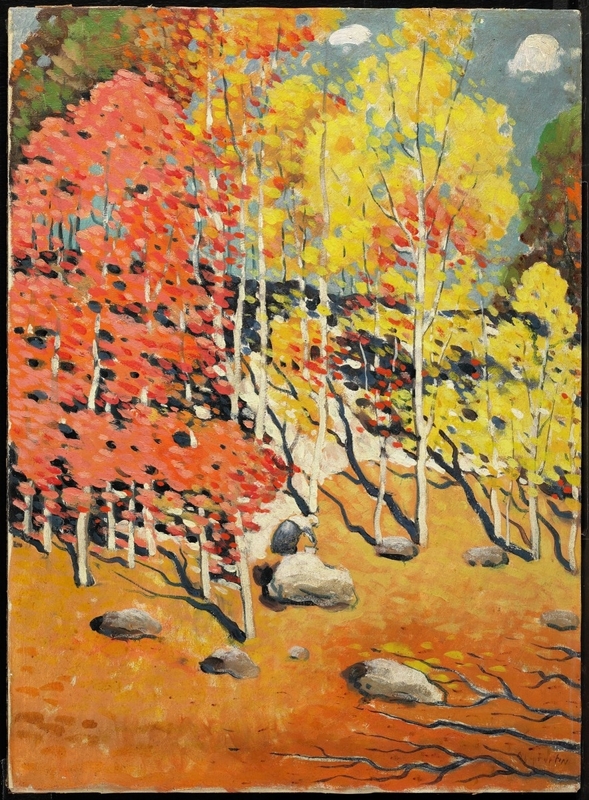 In 1928, critic Jean Chauvin dedicated a chapter of Ateliers, his book on Canadian artists, to Fortin, comparing him to "a magician conjuring up, out of the earth, out of his palette, giant trees, extravagant skies, a whole enchanted nature..."
Fortin returned to France for a year between 1934 and 1935, traveling around the country, drawing and painting. Upon his return to Canada, he moved to Sainte-Rose and started experimenting with the application of pure colours onto a black surface, achieving luminous, brilliant colour. Later, he used a similar approach with a grey surface. Starting in the late 1930s, Fortin made painting trips to the Gasp_ region, where he met Alexandre Bercovitch. Around this time, he experimented in watercolour highlighted with black pencil or pastel, and in the 1950s, painted in casein. Beginning in 1955, Fortin suffered declining health and increasingly miserable living conditions. He lost both legs to diabetes and stopped painting for seven years, eventually resuming work from a wheelchair. In 1967, he moved to a sanatorium in Macamic, in the Abitibi region of Quebec. By the time he died at the age of 82, he had produced an estimated 8000 to 10 000 works, many of which were lost over the years to fire or unscrupulous dealers.